By the spring of 1915, combat on the Western Front had sunk into stalemate. Enemy troops stared at each other from a line of opposing trenches that stretched from the English Channel to the Swiss border. Neither opponent could outflank its enemy resulting in costly and unproductive direct attacks on well-fortified defenses. The war of movement that both sides had predicted at the beginning of the conflict had devolved into deadly stagnation. Allied leaders, including Winston Churchill and Lord Kitchener, scoured their maps to find a way around the impasse. The Dardenelles Strait leading from the Mediterranean to Istanbul caught their eye. A successful attack in this area could open a sea lane to the Russians through the Black Sea, provide a base for attacking the Central Powers through what Churchill described as the "soft underbelly of Europe", and divert enemy attention from the Western Front. The Campaign was a fiasco, poorly planned and badly executed. It began in February 1915 with an unsuccessful naval attempt to force a passage up the Dardenelles. The flotilla retreated after sustaining heavy damage from Turkish guns lining both shores and from mines strewn across the channel. 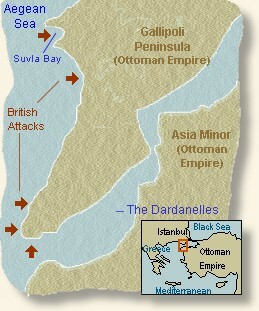 In April, a landing on the Gallipoli Penninsula attempted to secure the shores and silence the Turkish guns. Trouble brewed from the beginning. Amphibious operations were a new and unperfected form of warfare leading to poor communications, troop deployment and supply. The Turks entrenched themselves on the high ground pouring artillery and machine gun fire down upon the hapless Australian, New Zealand, Irish, French and British troops below. The battleground soon resembled that of the Western Front - both sides peering at each other from fortified trenches, forced to spill their precious blood in futile frontal attacks on well defended positions. The stalemate continued through the fall of 1915 until British forces withdrew at the end of the year. Casualties were high - approximately 252,000 or 52% for the British/French while the Ottoman Turks suffered about 300,000 casualties or a rate of 60%. The failed campaign gained little and badly tarnished both Churchill's and Kitchener's reputations. "We were in reserve to the 6th Dublins and 6th and 7th Munsters. They took the hill called 'The Pimple' - nothing but big stones and short scrub. It was taken about six in the evening. We took it over from them about 8:30 o'clock. During the day we had been under cover about a mile back, from about eleven o'clock that morning. Then the fun started. We could see the Turks quite easily. Jack Boyd and I were lying together keeping watch, and about 11 p.m. I said: ' What about something to eat,' as we had had only a bit of ' B.B.' and a few biscuits since morning, and our bare quart of water, which was half gone by this time. We divided a tin of bully beef, and had a good supper and nearly finished our water. The last meal poor Jack ever had. By morning our bottles were empty, and no prospect of getting any more. At 3:30 a.m. their counter-attack started. While debating this over in my mind I was lying quite close to a chum called Cecil Murray (from the Bank of Ireland); he was badly hit. I asked him where he was hit. He showed me his left hand, which was in pulp, and, while speaking to him, he was hit three times in the body. The groans were heartrending. Then a young chap called Elliott, who played 'footer,' was shot in front of me when running out; he jumped about three feet when hit; he started trying to crawl back to our lines, and just got above me when he was hit again. He died in a few minutes. Then came my dash for safety. I made two rushes of it, and had to shout to our fellows to stop firing to allow me to get in. I got a splinter of a bullet in the side. It just pricked the skin and stuck in my belt. There is a hole in my belt where it stuck. When I got behind the line, the first thing I saw was Lex, bandaged all over the head and shoulder, but could see no one else there. There were no stretcher-bearers of any sort, so I got permission from Lieutenant Hamilton to help him down the ridge. I then discovered my knee was cut and swollen. Either another splinter of a bullet or cut by the rocks. I could hardly walk. The sights I saw going along that place I shall never forget. Some of our fellows throwing back the bombs which the Turks threw over and which had not exploded. One fellow caught them like catching a cricket ball. Wounded and dead lying everywhere. The sun streaming down and not a drop of water to be had. Neither had we bombs to reply to the Turks and drive them out. We were relieved about 8 o'clock and then went back to our dug-outs about one mile back. just as we were getting our dinner, two shells came along, and one fellow from 'A' Company got his head blown off, and Sergeant Kenny of 'A' Company, an 'Old Tough' of the 2nd Royal Dublin Fusiliers, lost a leg. Our only officer left was Hamilton, badly wounded in the foot. Our platoon numbered about sixteen, and three of us were left of No. 8 Section - Hanna, Egan, and myself. It was a miserable time. That night we went up again, but not so far as in the morning. We had retired about half a mile." Hanna, Henry, The Pals at Suvla Bay (1917); Keegan, John, The First World War (1999). 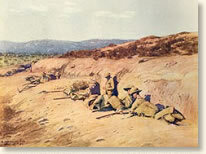 "Battle At Gallipoli, 1915," EyeWitness to History, www.eyewitnesstohistory.com (2001).